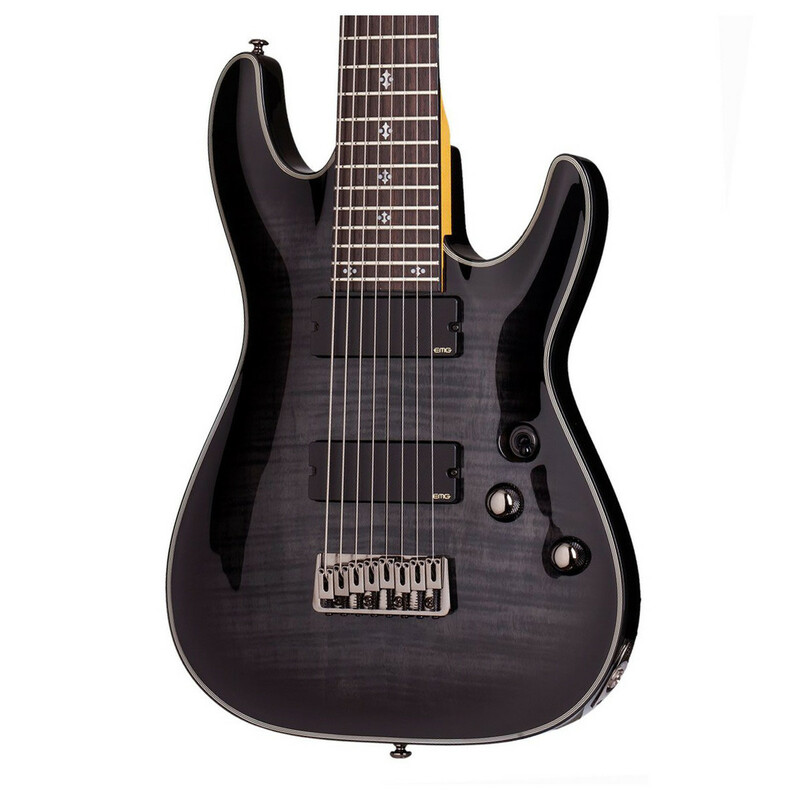 The Schecter Damien Elite-8 Electric Guitar features a carved Mahogany body with a Flamed Maple top. The Elite excels in blending between heavy and clean styles of playing, offering an incredibly versatile guitar. The Schecter incorporates a range of impressive finishing features such as active EMG Pickups, bolt-on neck with a Rosewood fingerboard that has 24 X-Jumbo Frets, and Grover machine heads. Schecter's Damien Elite-8 is a well-balanced guitar from aggressive crunchy sounds to rich, clean tones, perfect for the modern day player. The body's arched top contour provides a great resonance, enhancing the natural tones of the body wood, whilst the natural beauty of the Flamed Maple provides a great look. The Mahogany body offers naturally warm tones, with a touch of bite for creating tights lows and appealing highs. The 3-piece Maple neck and Rosewood fingerboard has been designed with a thin "C" shape for a smooth, fast play. The Maple/Rosewood combination produces warm, soft tones with sparkling highs and thick lows. It also comes with many other features including Grover tuners and a pearloid gothic inlay on the fretboard. 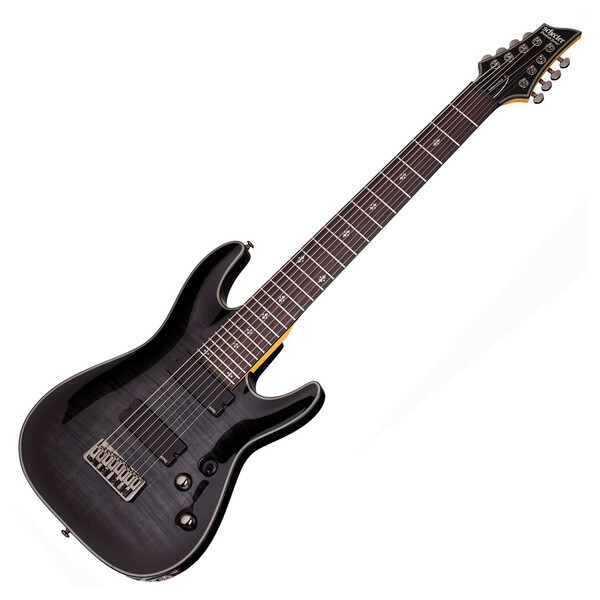 It has 2 EMG active pickups, producing rich, full bodied tones and a great organic sound. At both the bridge and neck are 808 EMG humbuckers that deliver incredible tones, presence, and dynamics that an 8 string guitar requires. Featuring alnico V loaded, wide aperture coils, the humbuckers eliminates muddy bottom strings whilst offering a tight, responsive sound. 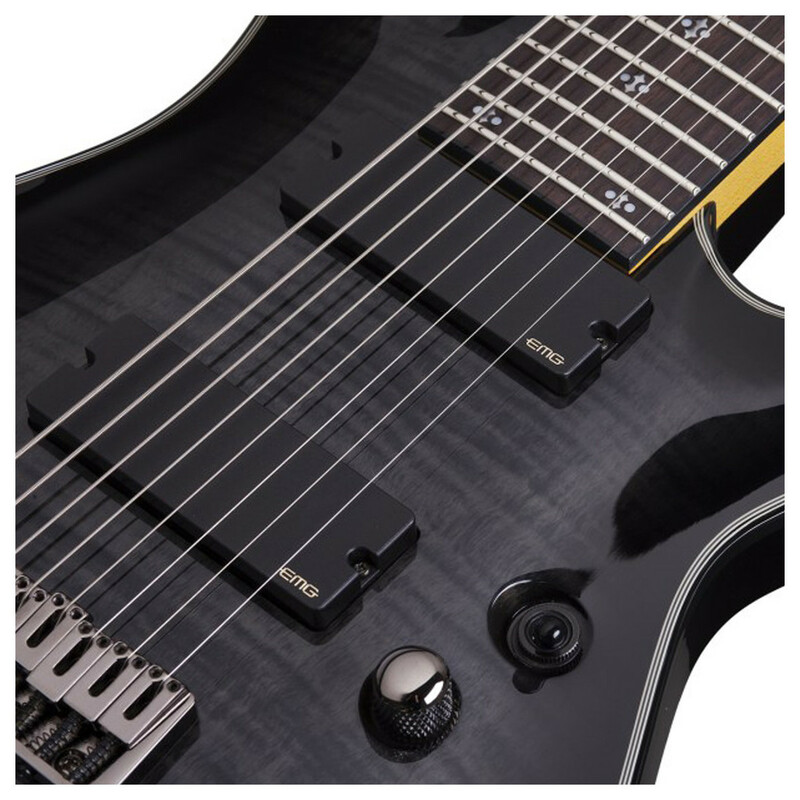 The EMG articulates every note the strings may produce, providing an incredibly well-balanced tone with an excellent upper register. 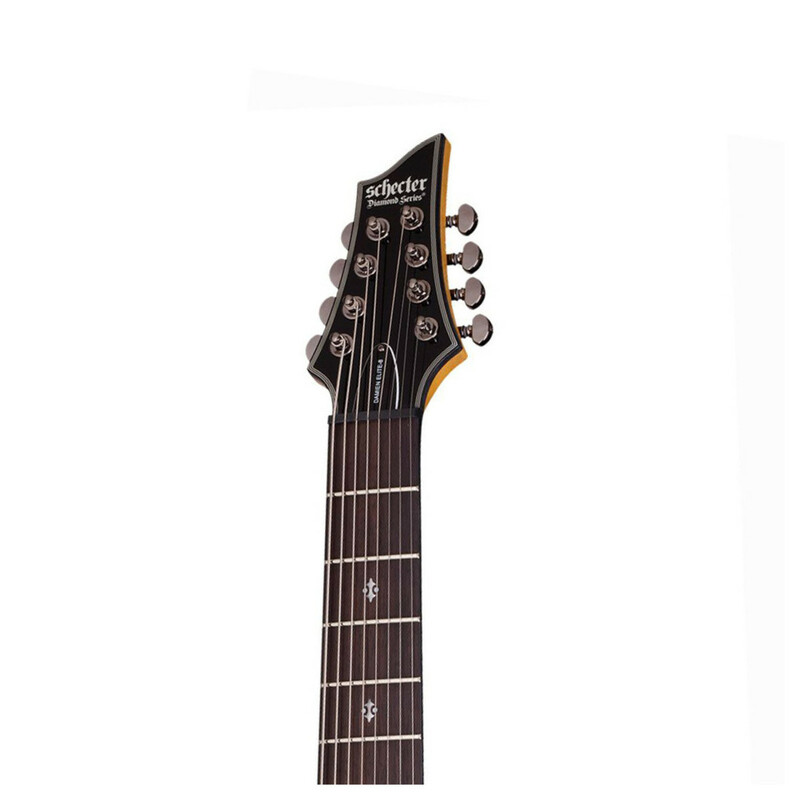 Schecter is one of the world's premier guitar companies, creating and selling electric guitars and basses, acoustic guitars and USA Custom Shop instruments to musicians around the world. They combine quality with affordability to suit a variety of different players and diverse musical styles. The company has a growing number of high profile artists playing their instruments, such as musicians from Disturbed, Avenged Sevenfold, The Cure, Papa Roach, Seether and more.